Rumours to the contrary notwithstanding, publishing is alive and well moving into spring. In the January/February issue, Q&Q looks ahead at some of the spring’s biggest books. The April release of Pedal It! ($19.95 cl.) by Victoria author Michelle Mulder marks the introduction of Footprints, a new series on environmental issues from Orca. 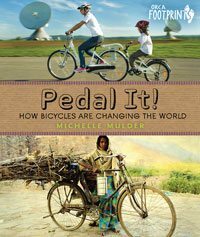 The book looks at how bicycles can make the world a better place. ¢ Athletic kids will love Weird Zone: Sports (Owlkids, $22.95 cl., $13.95 pa., April), in which former OWL magazine managing editor Maria Birmingham relays interesting facts about zany sporting activities, with the help of illustrations by Jamie Bennett. ¢ For those looking to try something out of their comfort zones, Inhabit Media presents Games of Survival: Traditional Inuit Games for Elementary Students, ($12.95 pa., March), in which arctic athlete Johnny Issaluk and photographer Ed Maruyama provide instruction for traditional Inuit activities used to teach kids survival skills for Northern climes. From Rona Arato comes the harrowing true story of how brothers Paul and Oscar Arato and their mother survived the Second World War. 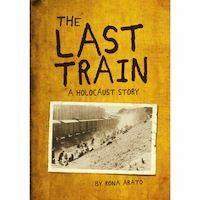 The Last Train: A Holocaust Story (Owlkids, $16.95 cl.) will be published in March. ¢ Until his recent retirement, Ken Setterington was the first Children and Youth Advocate for Library Services for the Toronto Public Library. 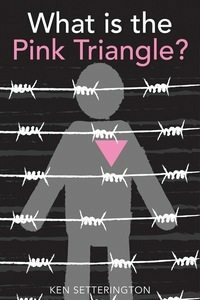 His new book, What Is the Pink Triangle? (Second Story, $15.95 pa., April), informs readers about the persecution of gays and lesbians by Nazis during and following the Holocaust. ¢ Toronto social worker Steven Solomon explains the ramifications of using put-downs and other homophobic language in Homophobia: Deal with It and Turn Prejudice into Pride (Lorimer, $24.95 cl., $12. 95 pa., April). Zoocheck Canada founder Rob Laidlaw tugs on animal lovers’ heartstrings with Saving Lives and Changing Hearts: Animal Sanctuaries and Rescue Centres (Fitzhenry & Whiteside $19.95 cl., Jan.), in which he explores efforts to improve the lives of animals around the world. ¢ Budding entomologists will be drawn like moths to a flame to a pair of titles by Chris G. Earley. Caterpillars: Find, Identify, Raise Your Own ($19.95 cl., $6.95 pa.) and Dragonflies: Hunting, Identifying, How and Where They Live ($19.95 cl., $6.95 pa.) will both be released by Firefly Books in March. Neil Flambé creator Kevin Sylvester teams up with fellow CBC personality Michael Hlinka to track what happens to hard-earned cash after it’s handed over to a cashier in Follow Your Money: Who Gets It, Who Spends It, Where Does It Go? (Annick, $24.95 cl., $14.95 pa., Feb.). Presumably, the authors hope some of it comes back to them after you buy the book. 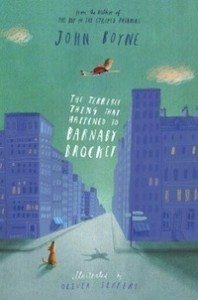 Irish writer John Boyne tells of The Terrible Thing that Happened to Barnaby Brocket (Doubleday Canada, $19.95 cl., Jan), in which our hero has problems staying Earth-bound. Oliver Jeffers, no stranger to whimsical predicaments in his own books, provides spot illustrations for the novel. 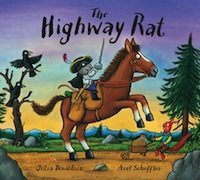 From Julia Donaldson and illustrator Axel Scheffler* “ the creative team behind The Gruffalo “ comes The Highway Rat (Scholastic $18.99 cl., March), about a snack-stealing rodent. ¢ Renowned Brazilian children’s author Ana Maria Machado adds another title to her vast cannon with What a Party! (Groundwood, $18.95 cl., March), in which a pre-birthday fÃªte gets a bit out of hand. Parisian illustrator HélÃ¨ne Moreau provides the visuals. ¢ The adventures of a girl and her amphibious pal continue in the graphic novel Anna and Froga: I Dunno, What Do You Want to Do? (Drawn & Quarterly, $14.95 cl., June) by Anouk Richard. From The Secret Mountain comes a storybook and CD combo that explores how birds have influenced music throughout history. Classical pianist Ana Gerhard contributes text to Listen to the Birds ($22.95 cl., May), illustrated by Cecilia Varela, which accompanies the CD of 20 recordings by the London Symphony Orchestra, the Toronto Chamber Orchestra, and more. Q&Q‘s spring preview covers books published between Jan. 1 and June 31, 2013. ¢ All information (titles, prices, publication dates, etc.) was supplied by publishers and may have been tentative at Q&Q’s press time. ¢ Titles that have been listed in previous previews do not appear here. *Correction Jan. 17: In the print and an earlier online version of this story Axel Scheffler’s name is spelled incorrectly.